This thread is for those who have no major "problem".........but just want to talk about what they are doing to their Birds. Me?? Im doing some small body work projects so I can prime ,sand,and paint my bird the color of midnight !!! Ive been using this "stuff" called Metal-2-Metal on bare metal to fix some small rust holes I discovered at the bottom of my door. I took a nail and gently tapped around the bad spot to sink it.........then filled it with the above mentioned filler. Its non-porous and sands down slick and smooth. Highly recomemded !!! The last thing I did was remove the splash shields behind the front wheels and clean/repair/repaint the sheet metal behind them. Luckily, there wasn't much patching to do. I then refurbished and repainted the shields themselves - sure makes the wheel well area look snazy with new paint. Getting ready to coat my exhaust manifolds and then after that I'm going to rechrome my front bumper, grille, etc. THEN after I get a 2nd and 3rd job, I'll save up all that money to rechrome my tail light bezels and waffle plates - ugh. Everything else is in really good shape after that! I have taken the windshield wiper motor out to replace the switch cable, which wasn't working. Installed the new cable now need to get vacuum hose and put back together. I took the back splash panel out of the drivers side front wheel well to look at the vacuum tank for the brakes. It doesn't look to bad. I started removing the undercoating in the wheel well also. I discovered a brazed repair in front of the coil spring tower on the mini-frame. A little puzzled about it as it was brazed, painted and undercoated and blended prteety well and appearing to have happened early on in life ( supposedly the car had been damaged on the front passenger side which I have yet to see evidence - don't think this is part of that). I am thinking about taking the front splash panel out as well to cleanup and repaint the whole inside fender. Also saw the rubber boot coming out of the bottom of the cowl section that must be the drain for it. I have begun sizing up weld-proofing my barn and hope to get the car set and maybe even finish demo for redoing the rockers. Unfortuanately I have to many things I want to do this summer so I'm not going to be able to do as much as I would like to on the car. I had planned on doing the rockers completely, but that is not going to happen. Now the plan is to do some misc. stuff and get the car set for major rocker work next season. Well lemme see. My 59 hardtop had been sitting since '74 and just recently have I gotten it up and running. - Put all new brake system in it, new master cylinder/ wheel cylinders. Bled the system and its working nicely. All new plugs and wires and distributer. But just yesterday I realized a problem with the carb. To get it running I've been dripping a little gas down in it with the air cleaner off. I ran it for a minute and then tested to see if there were any jets of gas coming through..Well of course not. Not enough at least. So i consulted a mechanic and he said the accelerator pump isnt working right. I took the carb in for a complete rebuild and a gasket kit. This is going to take 2 weeks to send off for the parts and get it done, but in the meantime I'm working on getting the taillamps to light up when the brake is applied (blinkers work). Got headlights working nicely. Also I am removing this horrible pink vinyl that the previous owner installed. The original black and white interior has been preserved nicely under this pink and woodgrain vinyl stuff they glued all over the place. I tell you............I can see why some people end up paying 3 to 5 thousand for a paint job on these cars. I stripped mine of its paint............primed..........sanded..........primed..... .....block sanded ...............primer sealed...............and Im still finding little flaws. The fact that these cars have so many lines and subtle curves doesnt help. BUT Im almost done now ...........and have about 1/2 a dozen little places to sand and then the last coat of sealer goes on. This has been a chore and a half !!! Knowing the black comes next has me licking my chops !!!! Well, I got all the glass for the car, ordering the gaskets tomorrow. I had always thought my hardtop didnt have power brakes because it didnt have the round brake booster that the master cylinder goes on to. The pedal said power brakes even. But I was looking under the dash and noticed that the power brake booster was UNDER THE DASH?? Anyways, I am having the carburetor rebuilt STILL beacause NAPA sent me the wrong parts. Turns out the carb is a CARTER AFB. I had always thought it was the Autolite 4100. I never knew these cars ever came with Carter carbs. Has anyone heard of this? I think I read somewhere that they put the carters on the 430 engines. I really dont think its the 430 though. How could I tell? Im pretty sure its a 352, but I have no idea how to know for sure. All 352's came from the factory with the 4100 carburetor. All 430's came from the factory with a Carter 4-barrel. you can tell a mel from an fe quite easily, fe's are very big, mel's make fe's look very small...he he he. >a CARTER AFB. I had always thought it was the Autolite 4100. >I have no idea how to know for sure. That Automotive Mileposts site says that both the 352 and the 430 came with Holley carburetors. That is wrong. 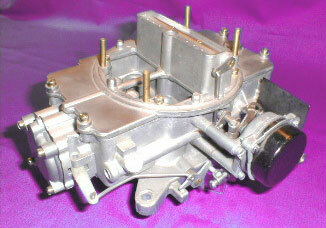 Holley's are listed as replacement carburetor's in the Ford parts book, but they are definitely not original. Yeah I noticed that all of them said Holley 4 - barrel, so that doesnt help. So I guess what I need to know is are there any distinguishing physical characteristics of the 430 engine that could help me discern between it and a 352? Would the data plate play any role in engine ID? My engine just doesnt LOOK quite big enough to be a 430. Also, what carb came on the 390? This brings up a good point. What are the distinguishing features of the Autolite 4100? With my carb installed, how can I be certain that it's not an aftermarket part that was replaced by the previous owner? Would it be an easy call if I were to post a picture of it here? The 352 engine and the 430 engine are easy to distinguish. The expansion tank is placed differently. the fuel pump on a 430 is on top while the 352 has it on the bottom. The intake manifold on a 430 does not completely cover the valley of the engine. the out board shocks are skinny about 1 3/16th at the dust sheild. at base of standard 60 push buttons. can get the caster, camber ,and toe set.